The authors have worked since 2000 to prepare school leaders at two California Institutions of Higher Education (IHE) in partnership with K-12 public, private, and charter schools. While transforming their programs into virtual delivery models, as an option for students, both online and face-to-face hybrid formats require conditions that help students effectively succeed as learners. Over fifteen years the authors have narrowed discussions for efficient facilitation and mapping to course content while personalizing lessons to deeply engage their learners' creation of new knowledge. They make twenty-three recommendations for streamlining course content, assignments, and assessments to meet individual needs of students while meeting the expectations and challenges of changing national and state standards. The authors conclude that ‘thinking anew' through faculty ideation is a must for IHEs as the changing learner demands changing practice. 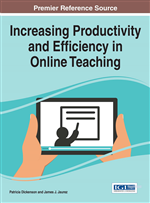 Narrowing discussions for efficient facilitation and mapping to course content effectively assists the instructor to engage the Millennial learner through the use of discussion boards, online chats, assignments, presentations, virtual collaborations and reflective digital portfolios. iPrincipals (Marcos & Loose, 2014; Loose & Marcos, 2015) are defined as those Millennials [the generation of the workforce born between 1982-2000], also known as the iY generation [iY generation is a synonym for the term Millennials], for whom the authors are responsible to prepare for school leadership at two California Institutions of Higher Education (IHE). Millennials, or the iY generation, were born from approximately 1982 to 2000 and represents 80 million of the U.S. population (Pollack, p.13). The needs of iPrincipals from this generation are much different than their older siblings who are referred to as Generation X (Gen X). iPrincipals regard Generation X’ers as their older siblings, and work place conflict between these two generations tends to occur especially if the Millennial is “the boss.” Millennials were born roughly between 1965-1981 and represent 46 million of the US population (Pollack, 11). The iPrincipals, as a group, are larger than the Baby-Boomer generation and Gen X, and hence are now the largest part of many work populations. The Baby Boomers have been dominant in the workforce for the past forty years and have begun a major exodus into retirement. Baby Boomers are the parents of iPrincipals and Gen X and were born between 1946 –1964 representing 76 million of the U.S. population (Pollack). Most university professors in educational administration tend to be of the Baby Boomer generation because they represent the current “experienced” and veteran administrators who have previously served in the educational system. The Baby Boomers have undertaken the responsibility to train the next generation of school leaders as part of their dedication to the service, development of the craft, and for “paying back” and “paying it forward” to those who helped them rise through the ranks and obtain their administrative positions. As faculty of Educational Administration, the authors engage two levels of the educational process, both higher education, and K-12, as they prepare school leaders for public, private, and charter schools. Whether through online virtual delivery of course content, or face-to-face in a hybrid format, they create conditions to help their students succeed as learners. Each delivery method is critically viable, each demanding equal consideration to streamline course content, assignments, and assessments to meet both national and state standards, but more importantly, the needs of today’s learner. Preparing Millennials aligned to accreditation standards is the common language across IHEs as faculty are engaged to both effectively teach course content, and reliably measure performance of candidates through valid assessments aligned to professional preparation program standards. In 1862 Abraham Lincoln wrote a message to Congress noting, “The dogmas of the quiet past are inadequate to the stormy present. The occasion is piled high with difficulty, and we must rise to the occasion. As our case is new, so must we think anew” (Lincoln, 1953, 537). Abraham Lincoln understood data. He understood that priorities and decisions substantially influenced practice. He understood that setting expectations modeled support for decisions and that collectively, while Congress had the power to practice their expectations, new expectations were needed. Lincoln’s thinking anew led America to address its practices, make collective decisions to improve, and to set new expectations for an entire nation. Improved practice was eventually institutionalized to become the norm. Another American institution, that of education, continues to inform itself with data, set new expectations, and support decisions that revise practice. Thinking anew is the work of schools today, both of K-12 practitioners and those faculty who develop and design programs to prepare the next generation of teachers and leaders. While standards ensure viability of both content and pedagogical knowledge, licensure programs, such as educational administration, teacher education, special education, or school psychology and counseling, also measure the effectiveness of clinical partnerships and practices, candidate quality, recruitment, selectivity, program impact, and provider quality and assurance as well as continuous improvement. Yet, a check mark that our course delivery and streamlined assessments meet program standards does not quite reach it for faculty. There is something much deeper, something much more altruistic for which faculty strive. That something which holds so much more for faculty satisfaction is our ideation. That place within us that engages our deepest sense of relevance as we meet the needs of Millennial learners. This is to what faculty cling. The changing learner demands changing practice, just as does a changing nation demand new practice from its changing expectations, decisions, and changing ideas. Our thinking anew, as faculty, elicits new expectations, new decisions, and new ideas that inform our practice. Introduce the reader to the different generations interacting in higher educational programs. Review the current literature related to the generations. Provide commentary and suggestions as to how higher educational programs can construct their curricula to address the current needs of Millennial students.